Authors often claim that writing a book is like having a baby — both in effort and length of time. Since I’ve done both myself, I would personally insist that birthing a child is, in fact, more difficult. There is value in the comparison though. Even when you write from a place of passion and purpose, you may still have trouble birthing your important ideas consistently. Babies tend to come into the world when they are ready, but how do you regularly give birth to remarkable content? You have to command it. Rather than waiting for inspiration to strike, I take control of the content on my blog. I’ve been a writer for over a decade. I began as a journalist and my reporting experience has greatly contributed to the success of my blog, but for reasons you might not expect. Of course I was trained to follow grammar rules and avoid commonly misused words, but the real value was the practice of writing daily, on subjects I didn’t necessarily care about, and meeting a deadline. I also knew that potentially thousands of people were going to read my work, so mediocre effort was not an option. During those years of reporting, and throughout more than five years of blogging, I’ve also never encountered writer’s block. In fact, I don’t believe it actually exists. Because writing good content, like anything else, requires proper research, planning, and execution. A prepared writer can implement a system to prevent writer’s block. I developed a process that allowed me to write articles in under an hour and hand them off to my editor, and I still use this process each day when I blog. A content strategy — before I created my blog, I mapped out my ultimate goal and the content I would need to write to accomplish it. I created 300 post topics and planned how they all would eventually link to each other. An ultimate goal — my writing goal is to provide useful information that will aid my readers in making lasting changes for our children’s futures. My ultimate goal keeps me focused on writing content that my readers will be able to find, enjoy, and use immediately. I discovered early in my journalism career that optimizing a writing environment and creating rituals are important. I optimize my environment by removing all of the excuses and interruptions that slow down the writing process. My current writing environment is a room in my house where I can put on soft music, avoid outside noise, have a cup of coffee or tea, and turn off the Internet. Years ago, I didn’t have the luxury of writing in the same place every day, so I created a writing environment with music on my CD player and a cup of coffee. Creating a special writing environment trains your mind to get in the mood to write when you are in that space. I’ve practiced this routine for so long that even a cup of coffee is usually enough to get me in the zone to write these days. If you’ve used the excuse you don’t have time to write, writing isn’t a priority for you. Maybe, but consider this: I have five children and the oldest is seven. I homeschool them. Our family is involved in multiple sports and activities. I cook 21 meals a week from scratch. I just finished the first draft of a cookbook. And I have written over 750 blog posts in the last three and a half years. Blogging is on my daily schedule. In fact, I block off one hour and treat it with the same importance that I treat a doctor’s appointment or my son’s baseball game. I won’t miss it. I stand at my desk (standing helps my creative juices), and for that hour I do nothing but write or attempt to write. If I finish one post, I start on another one until that hour is up. Schedule this time every day, even if you don’t need to create a new post. The extra writing time will help you become a better writer and give you time to practice without the pressure of having to hit Publish. One of the most frustrating aspects of blogging is the ailment known as “what-should-I-write-about-today-itis.” To avoid this illness of mind, I have a framework for topics I write about for different days of the week. I have individual checklists for the structures of each of these types of posts to make the writing process faster. The more structure you add to the framework, the less you have to start from scratch each time you write. Once you have established your content strategy and ultimate goal, split up your post topics into categories that refer back to your cornerstone content. A framework also provides consistency for your readers and teaches them what to expect from you so that you can become an authoritative online presence in your area of speciality. I also keep a running list of possible blog topics organized by category in Evernote for easy reference when writing. 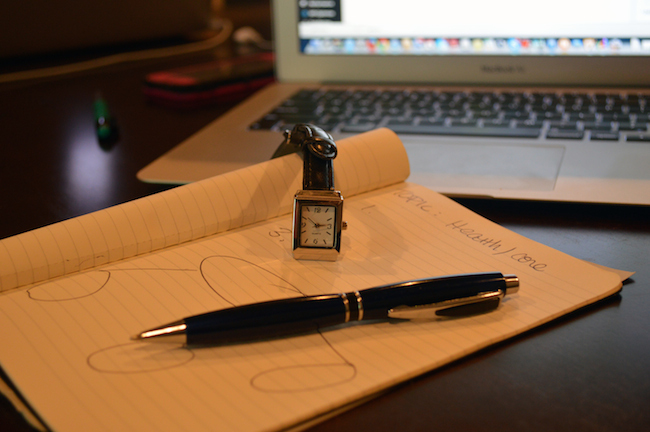 Sit down with a piece of paper and pen and create a two-minute outline for the content you plan to write. I start by writing the topic and working title at the top of the page. Then, I number three to five main points (or occasionally up to nine) and fill in bullet points under each of these sections. Use the full two minutes to get all of your ideas on paper before you begin so you can write the full post quickly. I only commit to writing the first 200 words after I outline. After 200 words, I re-read what I’ve written and make sure that I like the direction of the post. If not, I re-start with a new direction. I very rarely have to restart, but taking 30 seconds to reread and reevaluate helps refine the focus on my post. If I start over, I’ll save the 200 words I’ve already written in another document, so I can use them later in the post or for another post. Spend 10 to 15 minutes refining and editing your content. If you have an editor, you get to skip this step. I don’t, so I use the last 10 to 15 minutes of my writing time to find weak sections and refine the content. I usually trim down a blog post by a few hundred words and add links to relevant content. Have you ever struggled to get in the mood to write? Does a blogging schedule and routine help keep you on track? Let’s go over to Google+ and discuss other ways to birth extraordinary content on our blogs. Editor’s note: if you found this article useful, we recommend you read 10 Rules for Writing First Drafts and download the free poster to hang up in your writing space. Katie, a.k.a. The Wellness Mama, is a blogger, podcaster, author, wife, and mother of five. She blogs about health, nutrition, motherhood, natural remedies, and organic living at WellnessMama.com. Follow her on Twitter and Google+.